Cupcakes are the world’s most adorable pastry—but until now, people with gluten sensitivities struggling to find sweetness on a gluten-free diet haven’t had a cupcake cookbook to call their own. Enter gluten-free guru Elana Amsterdam, who has re-engineered the favored treat for today’s dietary needs. Her colorful collection showcases classics like Red Velvet Cupcakes and Vanilla Cupcakes and features creative concoctions like Ice Cream Cone Cupcakes and Cream-Filled Chocolate Cupcakes. These simple-to-make—and simply delicious—cupcakes rely on coconut and almond flours rather than the sometimes difficult-to-source gluten alternatives. Some of the recipes are even vegan and dairy-free, and none use refined sugar. 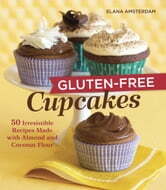 With fifty cupcake recipes plus a variety of frostings to mix and match, Gluten-Free Cupcakes offers delightful cupcake alternatives—as tasty as their traditional counterparts—to anyone in need of a little cupcake fix.